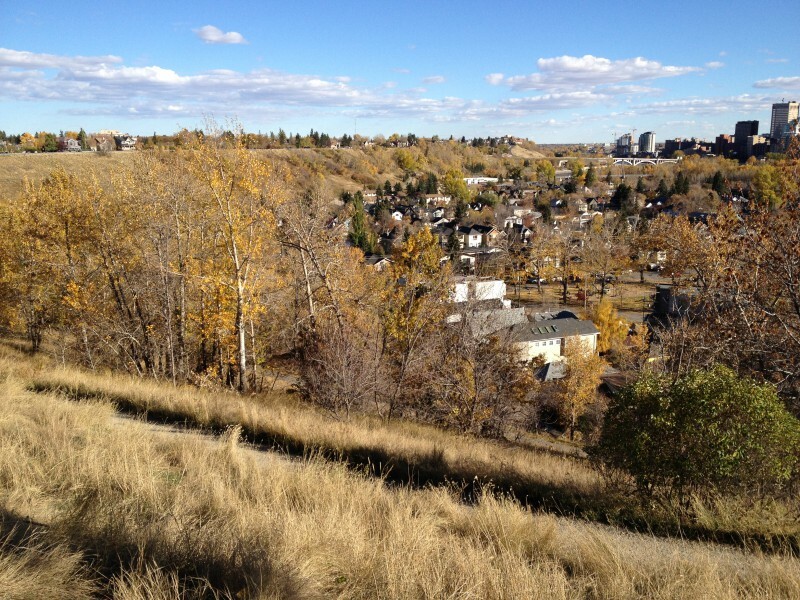 McHugh Bluff Park, northwest Calgary. I was a bit cranky on Sunday afternoon. I couldn’t find my Pinhead key! I’ve had the key for years and suddenly, gone! And I don’t own a spare, and I never bothered to write down the key number in case I needed to get it replaced. Daft! Oh, well. Turns out there is a Youtube video that shows how to open Pinheads without a key. A bike ride was now out of the question but a long walk in the warm and sunny afternoon would surely diffuse my irritation. A tasty cup of coffee somewhere in Sunnyside and a sweet pastry from the Sidewalk Citizen at the Sunnyside Natural Market would get the rest of the crank out. Last time I walked to the Sunnyside Market for white, milk and dark chocolate disks (yes, they have them all in bulk!!! ), I noticed some bluffs a few blocks northeast of the market. So, after my coffee and pastry, I strolled over to the bluffs.